God is well pleased with whom? 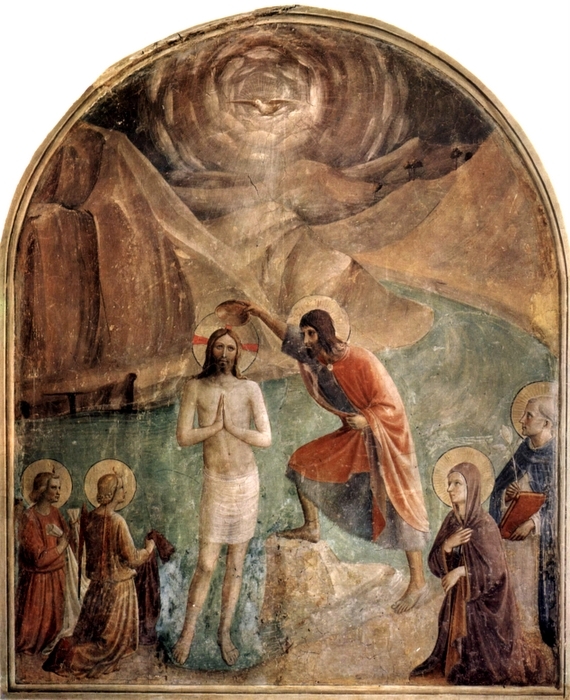 “Baptism of Christ”, Fra Angelico, 1450, San Marco Church, Florence, Italy. For those of us who believe in Christ Isaiah 43:1-7 ought to be a profound encouragement. God says, “Do not fear, for I have redeemed you; I have called you by name; you are mine” (Isa. 43:1). I’m sure I’m the only one in this predicament but there are days when I ask myself, “What am I doing with my life? !” God responds, “I have called you by name, you are mine” (v. 1). There are other days when I ask, “Why is this happening to me?” God responds, “When you pass through the waters, I will be with you” (v. 2). There are yet other days when I wonder whether I am having any impact on anyone around me. God responds, “I will gather my offspring from the east and from the west“. Some reading this might object: “Well, those are nice words, but do they really mean anything?” History tells us that they do. God did work to deliver Israel from Egypt. He did work to give them a land of their own. He did work to bring them out of Babylonian exile. And most significantly, he did work by sending them, and us, a Messiah and Savior in Jesus. In another of this week’s passages, Luke 3:15-22, the heavens opened, the Holy Spirit descended on Jesus in the bodily form of a dove, and God said audibly, “You are my Son … with you I am well pleased” (Luke 3:22). This actually happened. For those of us who believe, just as God was well pleased with his Son, so is he well pleased with all whom His Son calls friends. How would I live differently today if I knew that God was well pleased with me? He is. God is well pleased … with us. This entry was posted in Religion and tagged Isaiah 43, Luke 3 on January 8, 2013 by Steve Godfrey.